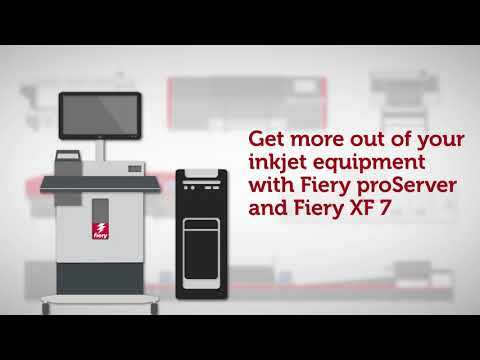 EFI Fiery XF is the color management solution for large to superwide format inkjet printing devices. Now, your printers can achieve a new dimension in color quality and productivity on banners, posters, signs and vehicle wraps! EFI Colorproof XF has changed its name to EFI FIery XF. Fiery® XF Version 7 is the easiest way to introduce sophisticated color management, including media calibration and output optimization of your wide-format device. The result is superior color accuracy and increased overall productivity. Accurate Fiery color management, with advanced spot- and process-color optimization offers you the best possible color output each and every time — without time-consuming trial-and-error color correction or complicated device link profiles. Tailor the fully customizable Fiery XF user interface to each operator’s tasks and skill set for greater efficiency and reduced error rate. Downloadable default media profiles and workflow presets make it easy to set up automated job processing. An EFI™ Software Maintenance and Support Agreementis included for the first year with your purchase. You get phone support and an ongoing stream of software releases, including the latest device drivers, plus all minor and major product upgrades at no additional charge. New dynamic smoothing technology eliminates file-related banding and ensures smooth and consistent quality for fine art production and high-end prints on more than 600 supported printers — from desktop to superwide format. The full WYSIWYG user interface for tiling allows you to immediately see all the applied changes, and the detailed visual assembly guide makes mounting even the biggest jobs a breeze. Add the Layout Option for sophisticated, automated cut path generation as well as nesting based on the true shape of your print jobs. You’ll save media and not cut away your bottom-line profit. Fiery XF includes Command WorkStation which provides users central management of all printers from a single screen. FAST RIP increases file processing speeds by an average of 5 times. It uses multi and parallel processing to enable jobs to spool, process, and print simultaneously. Minimizing printer idle time maximizes printer investment. Now a standard feature in Fiery XF Proofing. Transforms your proofing solution into a fast and efficient production device by functions, such as tiling, step-and-repeat, color adjustment, and clean color. The Production Option transforms your large-format printer into a fast production solution that achieves high productivity and outstanding color quality. It also enables you to offer your customers additional value-add services such as poster and banner production to boost your sales and customer satisfaction. In addition, the option lets you adjust color manually to meet any customer's specific need quickly and easily. Ensures perfect spot color matching on every print. It allows you to produce consistent colors across all medias preserving brand identities. Built-in spot color systems from Pantone, HKS, Toyo and DIC ensure that Fiery XF's definitions match the original definitions. Gain color precision, consistency and accuracy with the Color Profiler Option based on the renowned Fiery Color Profiler Suite. The advanced tool set provides quick and easy ICC and device-link profile creation that produces the highest quality results every time, increasing your customer satisfaction. The option enables you to inspect, edit and optimize profiles plus compare profile gamuts giving you ultimate control over your color output. Brings quality control to your environment enabling employees anywhere to work with the same colors and produce consistent color output every time. This flexible option supports a variety of measuring devices and industry standard control strips, plus EFIs unique Dynamic Wedge technology for job specific color verification. You can check your results against ISO standards, or your own quality standards by defining individual tolerances and values. It can also cut your distribution costs by serving as a reliable remote proofing and printing solution. Save time and money while decreasing waste. The Cut Marks Option generates and places cut marks into your job and can also extract multiple cut paths from your jobs. The option can directly connect to the Zünd Cut Center which ensures a reliable cut workflow by eliminating errors and automating time consuming tasks. This option also includes iCut level 1 and 2 output for maximum flexibility and connectivity to any third party cutting application. Support many output devices such as inkjet, LED and laser printers. Printer Option M supports A3/A2 printers with a printing width of 18". Printer Option XL caters for printers with a printing width of 19" to 24", while Printer Option XXL is for printers with a printing width over 25". The Fiery XF Production and Proofing packages include a Printer Option M-XXL. You can add other printer and output options at any time. VIDEO: What's EFI Fiery XF 7?